Neck bells are better protected from being banged and broken. The bells and strap don't get as dirty from kicked up snow and mud. The bells are less likely to tangle the lines (reins). The heavy bells cooperate with gravity by hanging from the lowest part of the strap. 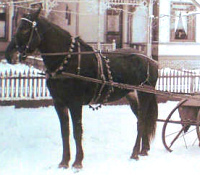 The most common neck strap has one or more rows of sleigh bells running the length of the strap. The bells can be all the same size or they can be graduated in size, with the largest bell hanging at the lowest point of the neck. The strap can buckle around the bare neck of the horse or around its collar, depending on the type of harness being worn. Middle: Robert and his Clydesdale gelding Shaq. Shaq is wearing a neck strap around his 30" collar. The strap has 21 antique bells ranging from 1 1/2" to 2 5/8" diameter. Photo courtesy R. Bates, © 2003. Some of these straps were long enough to buckle around the entire neck; many were just long enough to buckle around the bottom of the horse's collar. Bottom: Strap of three old neck bells, much used and lovingly repaired. 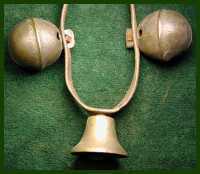 The two sleigh bells date to the early 1800s. The open bell and the strap itself are younger. Most neck straps are made of one or two layers of heavy leather depending on the type of bells used. The construction is much like a typical body strap, only shorter. A few makers constructed their neck straps more like a narrow horse collar. They sandwiched padding of horse hair, fine straw, or fiber between the bell strap and liner, then sewed the two straps of leather together along their length to hold the padding in place. Many neck straps have a buckle at one end and a tongue at the other, exactly like a trouser belt. This type of neck strap goes completely around the horse's neck. The tongue is either passed behind the hames or twisted around the wither strap before it is buckled, depending on the style of harness used. This precaution keeps the bells in place if the horse puts its head down. For a saddle horse or a horse in a breast-strap harness, the strap should lie comfortably along the shoulders and just below the horse's windpipe. For a horse in a collar harness, the strap should lie in the groove around the collar on top of the hames. The bell strap should not restrict the horse's breathing nor should it affect the fit of the harness. The buckle usually lies on top of the horse's neck. Safety tip: Be sure to buckle a neck strap so it cannot slide out of place if the horse puts his head down. The length of a neck bell strap depends on the fullness (width) as well as the length of your horse's neck or collar, so be sure to measure carefully. When in doubt, too loose is better than too tight. Draft horse or warmblood: 48 to 60 in. Cob to standard horse: 40 to 48 in. Mini to pony: 30 to 40 in.